Next Monday we will present a poster in META-Forum 2017 (Multilingual Europe Technology Alliance). 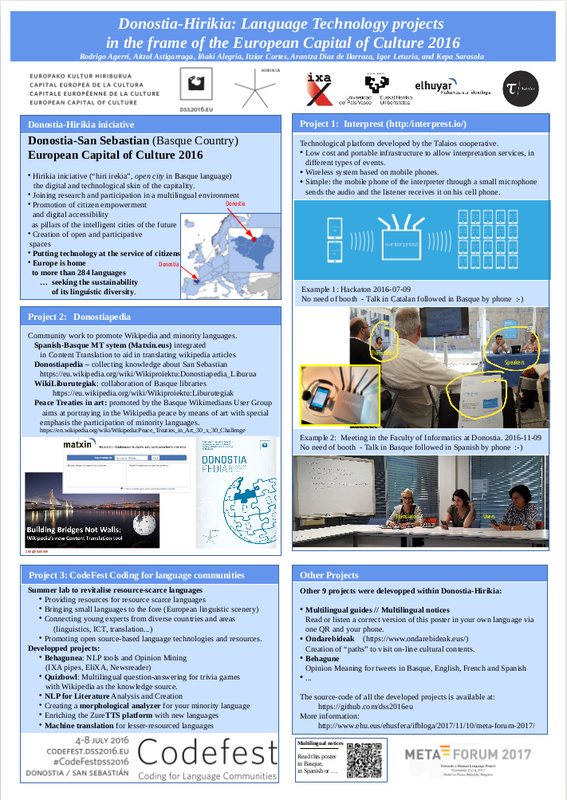 to explain some of the Language Technology projects we developed in the frame of the European Capital of Culture 2016. Ohareleanitzak. Have you visited the Albaola app museum in Pasaia? Although the explanations are written in four languages, they can also be read and heard in another 20 languages on the phone by installing the Albaola app. 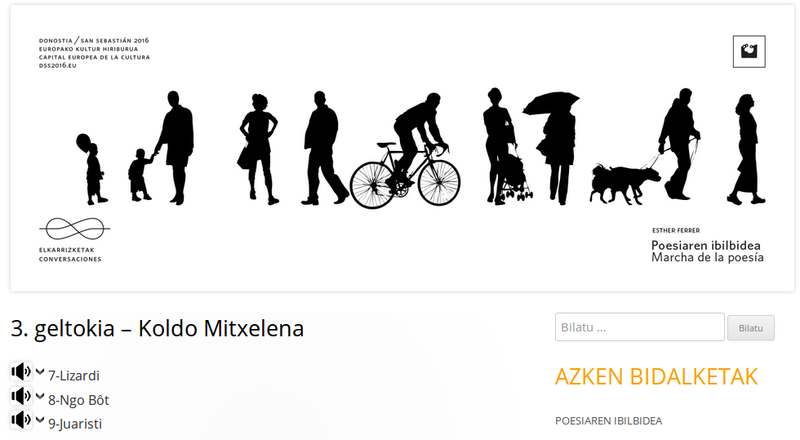 Manex Garaio, a student of the Faculty, designed the OharEleanitzak application for his Degree Project. The code and a guide can be obtained from github. It is an outdoor exhibition designed by the San Sebastian artist Esther Ferrer. At 12 points that can be found throughout the city there are QR codes available. if we scan them we will arrive at http://poesiarenibilbidea.dss2016.eu/ to listen and read the poems that the artist has designed for each stop. Behagunea is a tool to follow festivals or events in social networks. This website, in addition to compiling the edited content, classifies each edition, identifying which topic it corresponds to, and indicates whether the opinions are positive, negative or neutral. The developed website can be easily adapted to any new domain, so that any organization or society can use it. Donostiapedia Project. Many articles about Donostia and culture have been generated and expanded in several languages to enrich Wikipedia. Basque Wikipedia was our partner. As a first step, in 2015, 100 articles were generated in Amarapedia. In 2016 we launched Donostiapedia. On 9 July a successful wiki-editathon was organized in Plaza San Telmo. There were representatives of minority languages from all over Europe. Some of them participated in CODEFEST, a technology school for languages with limited resources, the previous week. The objective was to write a book about Donostia, and the book was published in December 2016. Infrastructures to make the city easier to access the internet. We worked in collaboration with several local institutions i2basque, Guifi.net, San Sebastian IT centre and Donostiako sustapena. Interprest is a technological platform powered by San Sebastián 2016, the European Capital of Culture and developed by the Talaios cooperative. The main goal of the system is to allow low cost and portable interpretation services. easily adaptable to different types of events. It is based on the use of mobile phones, it is therefore a wireless system. The communication process is really simple: the mobile phone of the interpreter through a small microphone sends the audio and the listener receives it on his cell phone. Hirikilabs is a collaboration project between Tabakalera and DSS2016. They work within the framework of social and collaborative technologies to create activities that relate the digital world and citizen empowerment, with a hacker, maker and “do-it-yourself” perspective on everything that is done and without forgetting the idea of “digital artisans”. A group of students from the faculty participated in the creation of the “Hitz Machine” and placed it in the new Donostia bus station. The machine offers small dictionaries in several languages. Promote the initiative Iturriak.org, within Wikisource. Through collaborative work, some writting material from our historical heritage have been transcribed. Ondarebideak: It is becoming increasingly common to be able to obtain direct digital access to the bibliographic, museum and in general to all types of archives. Unfortunately, so much information is stored that it is difficult to access it quickly and efficiently. In Donostialdea there is a lot of documentation related to culture. To promote it and bring it to life, the Ondarebideak digital platform has been created, where we can follow “digital exhibitions” created by experts as well as create our own exhibitions offering a personal, individualized reading and interpretation. These exhibitions or tours can be organized in different ways: general themes (architecture, music), by epochs (19th century), personalities (Father Donostia, Bilintx…). The IXA research group from the Faculty has been creating these interesting digital itineraries within the Paths project with European support. The results are being successful and now we want to move it to Donostia to help make our heritage, museums, places of interest…. It was put into operation in 2016 between Ixa taldea, Elhuyar and Euskomedia. Up to now, more than 25 routes have been defined. CODEFest Organization of the International Congress on Minority Language Technology Coding For Language Communities 2016 from July 4-8. HorKonpon, a repair shop. HorKonpon is an open workshop whose objective is to fix and reuse the small electric furniture. The aim of this initiative is to make people more autonomous (do it yourself) and to encourage group work (do it together). Euroku. This small game for mobile phones measures the knowledge we have about capital and culture. CodeSyntax has developed it. It uses an automatic question generation engine that feeds on Wikipedia.